Serve up a treat with this stylish two-tier serving set with six small porcelain bowls from Master Class. 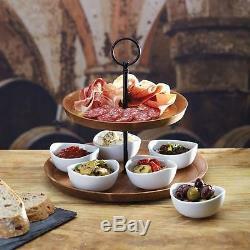 The set is perfect for entrees, tapas, finger food, canapes, cheese, dips, fruit and desserts. 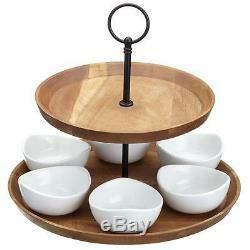 Simply add your snacks to the bowls and then serve guests from the acacia trays. Six porcelain bowls (dishwasher and microwave safe). Ideal for dinner parties and family meals. H7.9 x W27.6 x D28.5cm. The item "Wooden 2 Tier Finger Food Tapas Cheese Fruits SERVING TRAY SETS 6 Porcelain BOWL" is in sale since Saturday, January 28, 2017. This item is in the category "Home, Furniture & DIY\Cookware, Dining & Bar\Tableware, Serving & Linen\Serving Dishes". 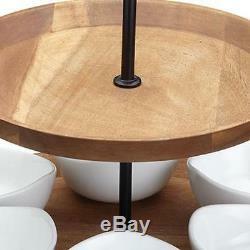 The seller is "worldealshopper" and is located in London. This item can be shipped to United Kingdom, Austria, Belgium, Bulgaria, Croatia, Cyprus, Czech republic, Denmark, Estonia, Finland, France, Germany, Greece, Hungary, Ireland, Italy, Latvia, Lithuania, Luxembourg, Malta, Netherlands, Poland, Portugal, Romania, Slovakia, Slovenia, Spain, Sweden, Australia, United States, Russian federation, Canada, Brazil, Japan, New Zealand, China, Israel, Hong Kong, Norway, Indonesia, Malaysia, Mexico, Singapore, South Korea, Switzerland, Taiwan, Thailand, Chile.